If you can’t tell from my posts, I’ve been on a sweet kick lately. I guess that happens after you pass 40. This is a really simple recipe for making “almost homemade” cinnamon rolls. 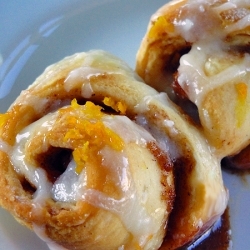 I love orange cinnamon rolls so I added orange zest to the rolls and orange juice to the icing, but if you prefer a more traditional cinnamon roll, leave the zest out of the roll and replace the orange juice in the icing with milk. The hardest part of making these is finding the frozen bread dough. You’ll have to check a real grocery store; I don’t think Walmart has frozen bread dough but I could be wrong. On a lightly floured surface, roll dough into a 14-in. square. Spread butter over dough. In a small bowl, combine the pecans, sugar, brown sugar, orange peel and cinnamon. Sprinkle over dough. Roll up jelly-roll style; pinch seams to seal. Cut into 1/2-in. slices. Place cut side down in two greased 9-in. round baking pans. Cover and let rise in a warm place until doubled, about 40 minutes. Bake at 350° for 14-16 minutes or until golden brown. Combine the confectioners’ sugar, butter, vanilla and enough orange juice to achieve desired consistency; drizzle over warm rolls. Yield: about 2 dozen. This entry was posted in Dessert, Holiday Cookies and tagged bread dough, brown sugar, butter, cinnamon, confectioner's sugar, orange, pecans, sugar, vanilla by quarlj01. Bookmark the permalink.